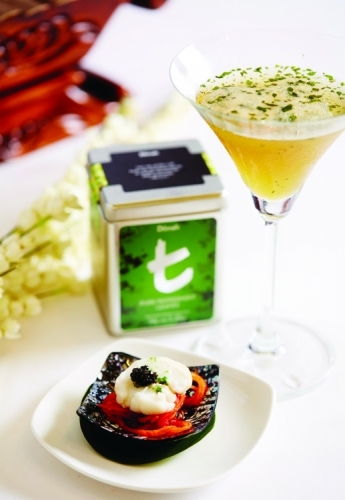 Pour onto the Oolong sorbet in the martini glass. Garnish with tea leaves. Boil water, sugar, glucose and Dilmah Oolong Tea until boiled and the tea is reduced. Soak the gelatin in cold water and melt the soaked gelatine in the microwave. Pour this into the mixture. Strain the Dilmah Oolong Tea mixture and put into the ice cream machine for about 10 minutes. After the mixture has frozen, keep in the freezer 1 night before use.